Even with less-than-optimal soil, you can grow a bumper crop of healthy fruits and vegetables with this unique garden design. Keyhole gardens, so named because they’re shaped like an old-fashioned skeleton-key lock, were developed to help folks with less-than-super soil grow nutritious produce. They were first established in the 1990s for residents of Lesotho, a small nation in southern Africa subject to frequent droughts and soil erosion. Keyhole gardening proved successful in providing a reliable source of food for the people of Lesotho, and the concept has spread across the globe. Read on to understand how these small, smart gardens work—and all it takes to start one of your own. 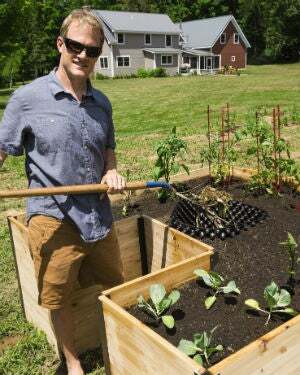 The traditional keyhole garden is a raised circular garden bed with a wedge-shaped cutout along one side that allows easy access to the center of the garden, where a cage serves as a compost pile. The cage is filled with yard and kitchen waste, which decomposes and releases vital nutrients into the rest of the raised garden. A keyhole garden is considered a type of permaculture (permanent agriculture) because it’s sustainable and regenerative. When watered, the nutrients from the compost spread through the soil, fertilizing it without the need for added commercial fertilizers. Because the soil is highly nutritious, you can grow more plants than you can in a traditional garden. The reason the garden is raised is twofold: It promotes adequate drainage, so the soil remains moist, but not soggy, creating an optimal growing environment. Plus, there’s no bending and stooping required to tend plants. 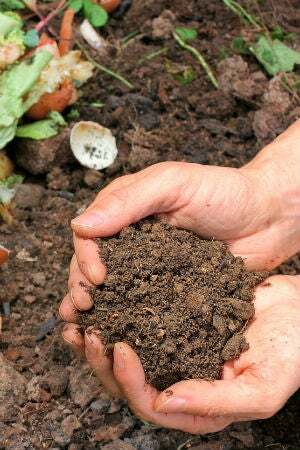 Composting is the method by which accumulated organic matter decomposes. It’s the ultimate recycling process—dried leaves, grass clippings, and leftover vegetable waste are placed in a mound or container, and with the addition of water, the decaying process begins. During decomposition, the organic matter breaks down and is transformed into dark rich compost—a fertile soil conditioner. The organic matter in the compost cage at the center of a keyhole garden is continually decomposing—the gardener adds new organic matter to the top of the cage while the layers beneath are decaying and releasing nutrients into the surrounding soil. By watering the keyhole garden at its center, the water drains through the compost and then into the rest of the garden bed, offering a constant source of nutrients. 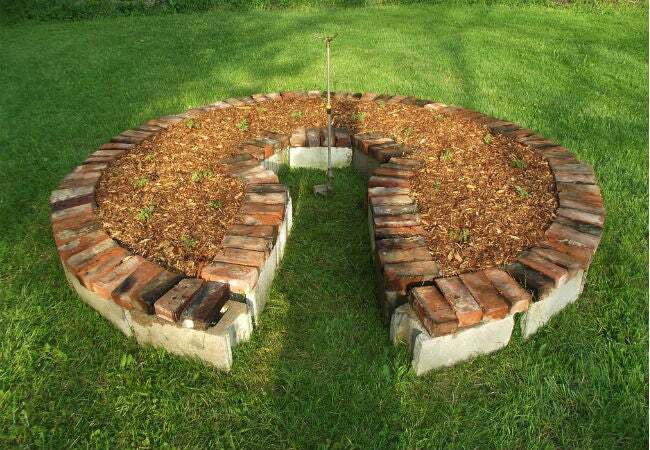 Stacked stones are traditionally used to create keyhole garden beds, but bricks, concrete blocks, and other materials can be used as long as it’s sturdy enough to support the soil. Keyhole gardens are relatively small—six feet in diameter, or less—in order for the gardener to be able to reach all areas. The outside wall is two to three feet high, and the compost cage in the center is often one to two feet taller. The cage is constructed from a perforated material, such as chicken wire, which allows water to flow easily out of the cage and into the garden bed. While the original keyhole garden shape is circular with a wedge-shaped cutout, there are no set rules. You can construct your own keyhole garden in any shape you like—circular, oval, square, or octagon—just be sure to include a compost cage in the center. Square PVC keyhole garden kits, measuring approximately six foot by six foot, are available from DIY centers and online retailers for between $250 and $500 (like this 3-foot-by-5-foot aluminum keyhole garden on Wayfair, which retails at $419.99, or this 6-foot-square cedar option from Gardener’s Supply Company, which retails for $499). Building your own keyhole garden is a simple process and no special construction skills are necessary. If you opt to purchase a kit, it will come with all the instructions you need to assemble the panels; if you prefer to build a traditional keyhole garden from scratch, the following tips will help. • Choose a location where the ground is level and not subject to flooding. Keyhole gardens are designed for function but not for looks, so most homeowners choose a backyard location rather than out front. • Determine the configuration of the outside wall. For a circular garden, hold a three-foot string in the center of the proposed garden and use the other end of the string as a compass to mark the perimeter wall location. • Allow for a 24-inch opening along the perimeter wall that narrows slightly as it reaches the center of the garden. • The compost cage in the center (if you’re making it from chicken wire) may require staking to hold it in place, and to keep it from collapsing when you add soil to the surrounding garden. • Use stacked stones, bricks, or concrete blocks to form the perimeter wall of the keyhole garden. Corrugated metal or old fencing are suitable as well, as long as it’s strong enough to retain the soil. • Consider lining the insides of the growing area with cardboard if the material you’re using to build the wall has large holes; without the cardboard, the soil may filter out or erode. The cardboard helps retain the loose soil but will also allow water to drain away. 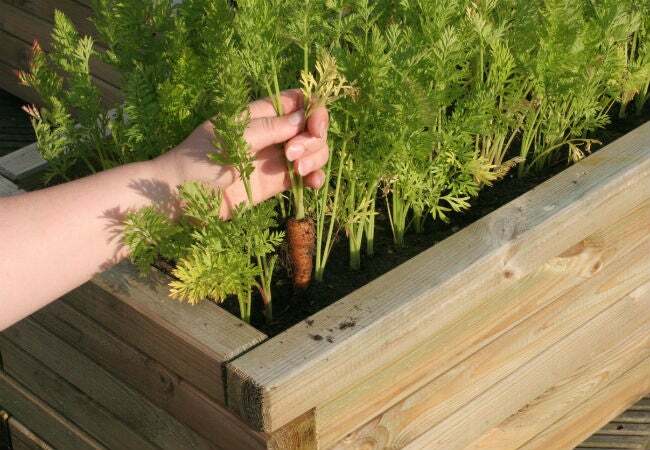 • Fill the growing area with the best soil you can get. You can purchase bags of “garden soil” or make your own optimal growing blend by combining equal amounts of sand, topsoil, and compost. • Grade the soil to slope down away from the compost cage so water runs to the outside edges. Just a slight slope; the soil level at the outside wall should be about two inches lower than the soil around the compost cage. • Put three to five inches of rocks or large gravel at the bottom of the compost cage to allow for aeration from the bottom. Compost needs air in order to decompose. 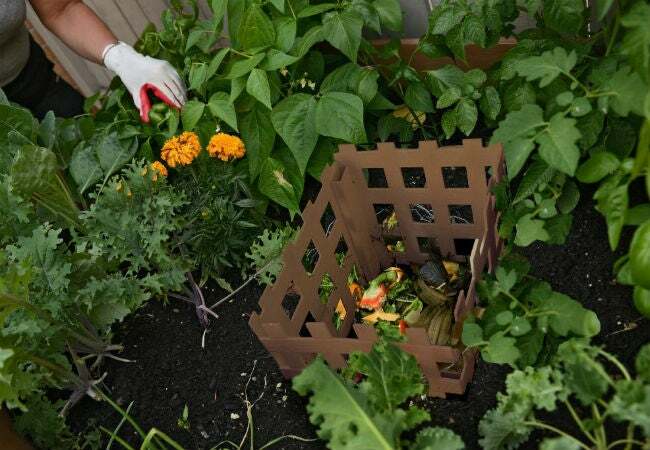 • Fill the compost cage to the top with alternating layers of kitchen scraps and yard waste. As it decomposes, it will provide natural fertilizer for the plants. • Plant your garden. What you choose to plant depends on what your family likes to eat, but good choices for keyhole gardening include lettuce, strawberries, tomatoes, carrots, kale, onions, spinach, herbs, and tomatoes. • Add a two-inch layer of dried leaves or shredded bark around the base of the plants. This is called “mulching,” and it helps keep the moisture in the soil from evaporating. Keyhole gardening is sustainable, meaning that these structures will provide their own nutrients for years when constructed and used properly. As you add fresh scraps from your kitchen to the compost cage, you’ll be constantly replenishing the compost, which will settle as it decomposes. For the best results, year after year, check out the following tips. • Water your keyhole garden in the center, directly in the compost cage. This allows the water to filter down through the compost and then seep outward, carrying nutrients to the soil every time you water. • Add kitchen scraps when the level of the compost drops. As the organic matter in the cage decomposes, it will become more compact. You shouldn’t need to add a lot of scraps, just a few now and then to keep the top of the compost level with the soil or slightly above. • Rotate crops annually. Some plants have shallow roots while others have deep roots that draw more nutrients from the soil. Plus, some plants contribute various nutrients to the soil—peas, for instance, add nitrogen—so by rotating the location of your plants every year, you’ll maintain a healthy soil balance throughout the entire garden. • Examine the garden in the spring and make any necessary repairs, such as replacing loose stones. • Clean out the compost cage once every three to four years to remove depleted compost and then start a new compost cage.